Purpose: To join, or take advantage of, the good name of the Defenders! 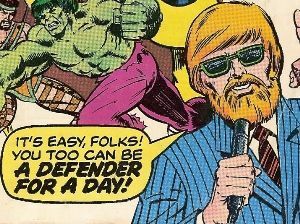 History: (Defenders I#62) - Film student Dollar Bill aired a TV special on the exploits of the Defenders, during which he invited any interested hero to join their ranks, even providing the address the Defenders headquarters' was located at. The next morning, over a dozen heroes responded to the invitation and showed up at Nighthawk's riding academy, immediately causing chaos. Nighthawk and Falcon got into an airborne chase, Marvel Man, Nova, Prowler, and White Tiger stirred up the horses, Captain Marvel and Jack of Hearts got into a fight over Hellcat, and a group of the heroes impetuously voted Hercules their leader due to his heroic experience. Valkyrie served some of the heroes poorly-made coffee. Black Goliath, Iron Fist, Tagak, Polaris, Stingray, Havok, and Torpedo decided to take down the Hulk while they had the chance, and moved to attack. (Defenders I#63) - After the Hulk fought off his attackers and Hercules broke them up with a tree trunk, the chaos started to die down. Several of the heroes, including Captain Marvel, Ms. Marvel and Paladin, opted not to remain for various reasons. Iron Man delivered news that several villains were operating in the city under the name Defenders. The heroes decided to act, dividing into three teams: Hercules lead Black Goliath, Captain Ultra, Havok, Hellcat, Iron Fist, and White Tiger, Valkyrie lead Falcon, Jack of Hearts, Prowler, Stingray, and Torpedo, Nighthawk lead Marvel Man, Nova, Polaris, Son of Satan, and Tagak, Captain Marvel, Hulk, Ms. Marvel, and Paladin chose to leave. The three teams headed to the city in their own way: Valkyrie's team flew (as they were all capable), Hellcat's team piled in her car, Nighthawk's team flew, some being carried by those who could fly. Nighthawk's team responded to a man's son stealing his dad's car, thinking the boy was a villain. Hellcat's team fought one group of villains (Batroc the Leaper, Beetle, Blob, Electro, Looter, Porcupine, Sagittarius, Whirlwind) until the police interceded. (Defenders I#64) - Hercules's team continued the fight, pursuing the villains on the subway, until Hellcat's mind powers lashed out of control and knocked everyone out -- heroes and villains. Nighthawk's team stopped the same adolescent from robbing his mom, then broke apart. Nighthawk came across a group of villains (Boomerang, Joe the Gorilla, Leaper, Libra, Melter, Pecos Bill, Shocker, Toad) who quickly defeated him, then Valkyrie's team fought the villains. Valkyrie fell into a warrior's madness and single-handedly defeated the villains and her allies before snapping out of it. The heroes on her team quickly left. (Defenders I#65) - The heroes on Hercules' team also quit as the villains were arrested. Policeman Kris Keating questioned those he could. Comments: Created by David Kraft, Sal Buscema, and Jim Mooney.